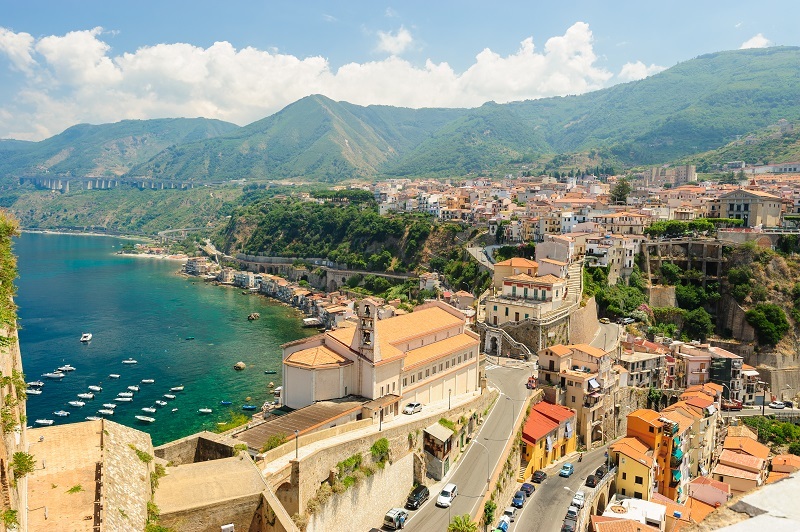 Calabria is the toe of Italy's boot, pushing into the Tyrrhenian and Ionian seas. It only shares a border with Basilicata to the north, but Sicily lies a short two miles off Calabria's tip. The region of Calabria is a peninsula almost entirely surrounded by water, so beaches are arguably the main draw for visitors. Away from the coast, Calabria shoots upward into the mountain peaks of three different ranges, Pollino, La Sila, and Aspromonte, that are often densely covered in forests. In the hilly areas, olives, wine grapes, and citrus fruits are major crops. The biggest city in Calabria, Reggio Calabria, has the National Museum of Magna Grecia and the fabulous Riace bronzes. Tropea is one of Italy's most dramatic beach towns, with pale cliffs jutting up behind the sand. Other beach towns include Scilla, Pizzo, Diamante, and Paola, all of which are packed with Italian beachgoers in the summer. The chronic lack of development and infrastructure in Calabria makes public transportation less than ideal, unless you're headed to the major cities. While you can get to Reggio Calabria and the regional capital of Catanzaro by train, your best bet for seeing the more remote parts of Calabria, including many of the prettiest beach towns, is to have a rental car at your disposal.